A major snowstorm that paralyzed much of the South is expected to hit the Northeast on Tuesday, possibly dumping more than a foot of snow in regions still digging out from recent storms. The National Weather Service issued a winter storm watch for New York City from Tuesday evening through Wednesday afternoon, calling for the city and its suburbs to get between 6 and 12 inches. Forecasters also predicted up to 8 inches in Philadelphia, while parts of Massachusetts could see 18 inches. The storm will produce near-blizzard conditions with frigid temperatures, MyFoxBoston.com reports, and is expected to fall heavily, at a rate of 1 to 3 inches an hour. The Weather Channel also reports that storm systems from the South and Midwest are expected to merge. The wintry blast, which pounded the South on Sunday and Monday, sent cars sliding off the road, emptied grocery shelves and had officials nervously watching ice-laden powerlines and tree limbs. Snow ranging from several inches to more than a foot blanketed states from Louisiana to the Carolinas — a region where many cities have only a handful of snowplows, if any. And more misery was on the way: The snow began turning to freezing rain in numerous areas, and low temperatures threatened to turn roads that may have thawed icy overnight. Freezing rain followed the snow in many spots, turning major highways into ice rinks and coating pine trees and power lines. Truck Stop in Haughton, La. The storm shut down most cities and towns, closed many businesses, and canceled most flights at Atlanta’s Hartsfield-Jackson International Airport, the world’s busiest. 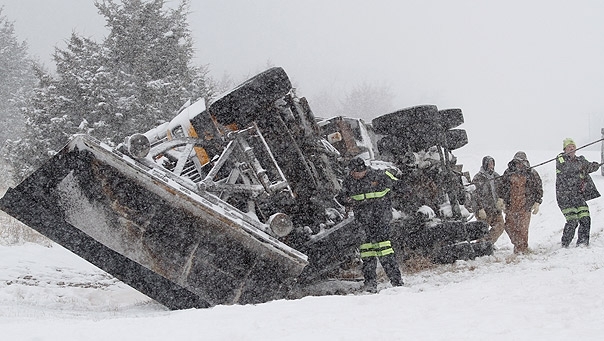 At least nine people were killed in weather-related traffic accidents. No widespread power outages had been reported, but many across the region fell asleep with flashlights by the bed and extra blankets at the ready in case the electricity went out and took their heat with it as temperatures plunged into the 20s. warning. Kym Littlejohn was heeding the governor’s call for people to stay home. Conditions were unlikely to improve anytime soon. Temperatures should stay below freezing for days, and more snow is predicted. That means treacherous travel conditions could persist until Wednesday or beyond. “The problem here is that they’re not used to it, so the equipment and the sanitation removal and the snow removal is not really geared for this kind of situation,” said Tino Grana, 48, of New York City, who traveled to Atlanta to sell art at a downtown trade show. Atlanta, which got 4 to 7 inches, has just eight snow plows. The city hired a fleet of 11 privately run trucks to help spread salt and gravel. The heaviest snow fell in parts of Tennessee that received as much as 13 inches. The weather began rolling across the South on Sunday, coating bridges and roads with snow, sleet and freezing rain. The governors of Alabama, Georgia, Louisiana, North Carolina, South Carolina and Tennessee declared emergencies. Schools and colleges called off classes for a second day Tuesday. South Carolina troopers worked nearly 2,000 wrecks Monday, state Highway Patrol Sgt. Kelley Hughes said. More were expected overnight as the slush on major highways was freezing again. Like many southern states, South Carolina has limited equipment to fight frozen roads. In all, it has about 800 pieces, and that’s even using graders to smooth asphalt to push away slush along with snow plows and salt spreaders. In Georgia, the storm forced inauguration ceremonies for newly elected Gov. Nathan Deal to be moved inside from the state Capitol steps. Arkansas officials planned to move their inauguration indoors Tuesday. Drivers struggled to stay on slippery pavement, and roads were littered with abandoned vehicles. Some motorists got out in the middle of the interstate to push their cars up ice-covered ramps. “Towns down here just don’t have the equipment to deal with this much snow,” said Joel Weems, a worker at the University of Mississippi. At Blackhawk Hardware in Charlotte, owner Jim Wilkerson was hoping for a Tuesday delivery of shovels and ice melt. There was only one problem: the warehouse is in snowy Atlanta, and as of Monday afternoon couldn’t even get enough workers in to load trucks. But the latest storm also offered kids — and some adults acting like kids — a rare chance to play in the snow. In Memphis, 21-year-old Ronni Jupson said the roads weren’t as bad as she feared they would be.